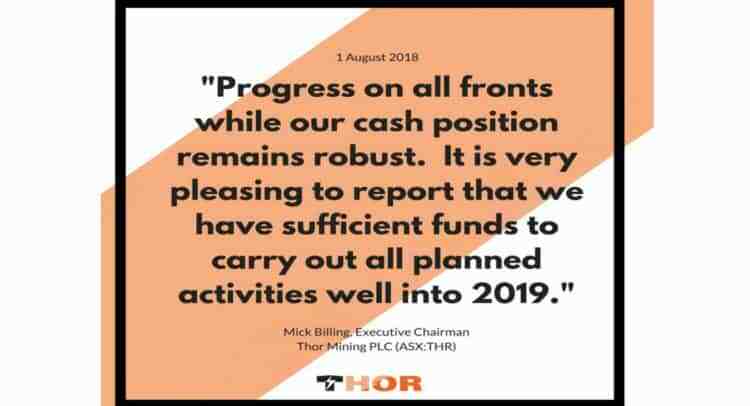 The Board of Thor Mining Plc (“Thor” or the “Company”) (AIM, ASX: THR), is pleased to provide an update for shareholders regarding warrant exercise. The Company confirms that it has received binding warrant exercise notices for the conversion of 31,203,947 warrants at the exercise prices shown below, resulting in aggregate gross proceeds being receivable by the Company in this tranche of £380,447. Application has been made to the AIM Market of the London Stock Exchange (“AIM”) for 31,203,947 Thor ordinary shares of 0.01p each (“Ordinary Shares”), pursuant to the warrant exercise, which rank pari passu with the Company’s existing issued Ordinary Shares, to be admitted to trading. Dealings on AIM are expected to commence at 8:00am on or around 10 December 2018 (“Admission”). For the purposes of the Financial Conduct Authority’s Disclosure Guidance and Transparency Rules (“DTRs”), following Admission, Thor will have 716,900,540 Ordinary Shares in issue with voting rights attached. Thor holds no shares in treasury. This figure of 716,900,540 may be used by shareholders in the Company as the denominator for the calculations by which they will determine if they are required to notify their interest in, or a change to their interest in the Company, under the ASX Listing Rules or the DTRs.